Fantastic Syn free recipe 🙂 Perfect for a fakeaway night. Serve up with our delicious Syn free beef curry. Peel potatoes and cube them. Also prepare cauliflower if not using frozen. Heat a little Frylight in a non stick pan. Add the onion and red pepper and heat until softened. Add garlic, curry powder and ginger and heat for a further 30 seconds. 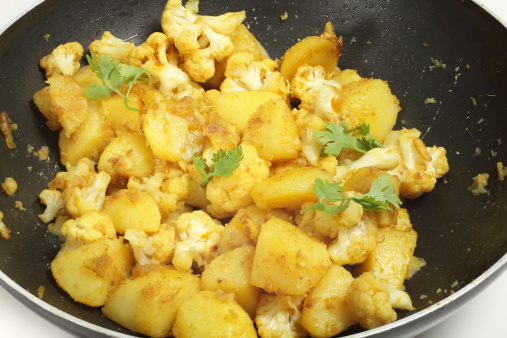 Add potatoes, cauliflower and peas.. stir fry for 3 -4 minutes. Stir in the pasata, water and sweetener and bring to the boil. Cover with a lid if possible, stirring regularly and simmer for 15 to 20 minutes or until the vegetables are soft.